The history of autism may be rewritten in the light of new evidence. 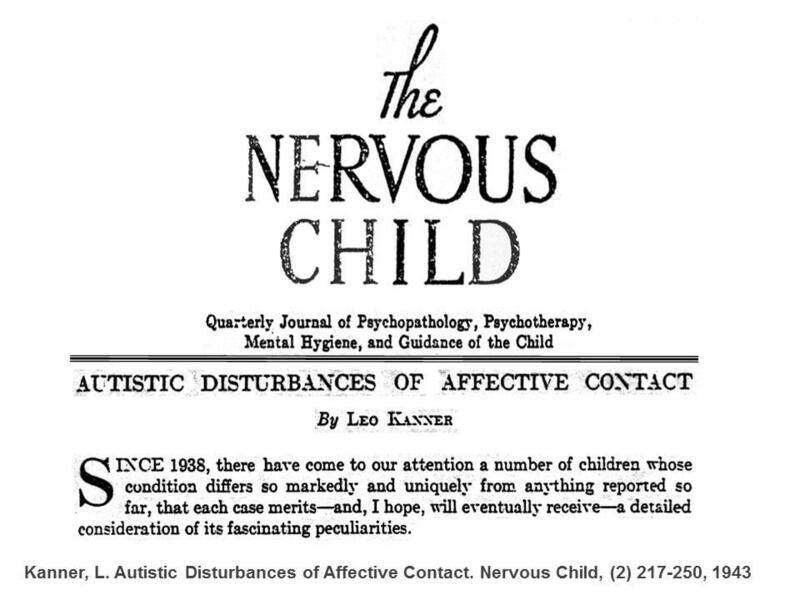 “Since 1938, there have come to our attention a number of children whose condition differs so markedly and uniquely from anything reported so far, that each case merits – and I hope, will eventually receive – a detailed consideration of its fascinating peculiarities.” So begins Leo Kanner’s landmark paper, “Autistic Disturbances of Affective Contact,” published in the spring of 1943 in the now-defunct journal “The Nervous Child – The quarterly journal of Psychopathology, Psychotherapy, Mental Hygiene, and Guidance of the Child.” Hidden within that seemingly innocent sentence is a startling clue that weaves together the best and the worst in all of us – including, I’m afraid, Leo Kanner. In 1934, a bombastic little man with funny hair got himself legally elected as Chancellor of Germany – the self-proclaimed greatest nation on the continent of Europe – on a wave of racist xenophobia fueled by economic unrest. According to the charismatic man with bad hair, Jews were the cause of Germany’s woes, so Germany (indeed, all of Europe) needed to be made “Juden rein” (“clean of Jews”) – initially through forced expulsion (which might have worked, except there were precious few countries in the world who would accept Jews. The USA and Great Britain actively collaborated to prevent the entry of Jews into their own territories, even turning back refugee ships that had made it all the way across the Atlantic), but ultimately via the “final solution” of mass extermination. Across Europe, scattered non-Jews rose to the occasion, rescuing as many of their Jewish countrymen as they could, helping Jews to hide or escape. Their stories are both inspiring and harrowing (go here or here for two of the better-known examples). Jews in America did what they could to sponsor and bring out Jews from Europe – despite the deliberately restrictive visa policies established by their own government. If one had an American relative or sponsor, there was a chance – albeit slim – of escaping Europe before the doors were slammed shut on September 1, 1939, when Hitler’s Nazi divisions invaded Poland. (This is generally accepted as the formal date for the beginning of World War II; Hitler himself joked that he had picked the date to make it easier for schoolchildren to remember). However, Nazi aggression had been building ever since Hitler – the man with the funny hair – had gotten himself elected 5 years before. Most notably, Hitler “annexed” Austria in 1938 (Whether it should be called an “invasion” is still a subject of debate, given the wildly enthusiastic response from most Austrians). If you were an Austrian Jew, however, the Anschluss marked the beginning of the end. By November of 1938, the infamous “night of breaking glass” (Kristallnacht ) made plain what lay ahead for Austria’s Jews (indeed, all the Jews of Europe). With this as background, now let us return to Kanner’s paper. Why did Kanner open his paper with the phrase “Since 1938?” Why did he use the passive voice: “there have come to our attention,” rather than the active voice “I have discovered”? In a book to be released on August 25 (NeuroTribes: The Legacy of Autism and the Future of Neurodiversity), author and medical researcher Steve Silberman reveals the astonishing answer: In 1938, Kanner had hired a refugee Jewish physician recently escaped from Austria, by the name of George Frankl. And George Frankl had been Hans Asperger’s collaborator in Austria. (Kanner and Asperger never met. Asperger – a Christian – remained in Austria throughout the war. He published his own paper on ASD on June 3, 1944 – three days before the Allied invasion of Normandy. His clinic was bombed by the 8th Air Force as the allies slogged across Europe, and many of his papers were destroyed. His work – what was left of it – remained largely unknown to the English speaking world until picked up by Lorna Wing, MD, the British psychiatrist who, in 1981, coined the term Asperger Syndrome.) 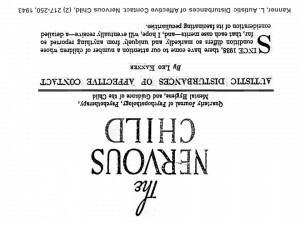 But now it seems that Leo Kanner’s bland opening sentence conceals a secret: As Silberman documents, Kanner had recently hired Frankl, and it was Frankl – not Kanner – who actually evaluated Kanner’s famous “patient #1” with autism. Silberman’s book is due out August 25. I can hardly wait to get my hands on it. Leo Kanner may not have discovered autism at all. Thanks for the update. This is very interesting. I will be looking for the book as well. Thank you for sharing this.